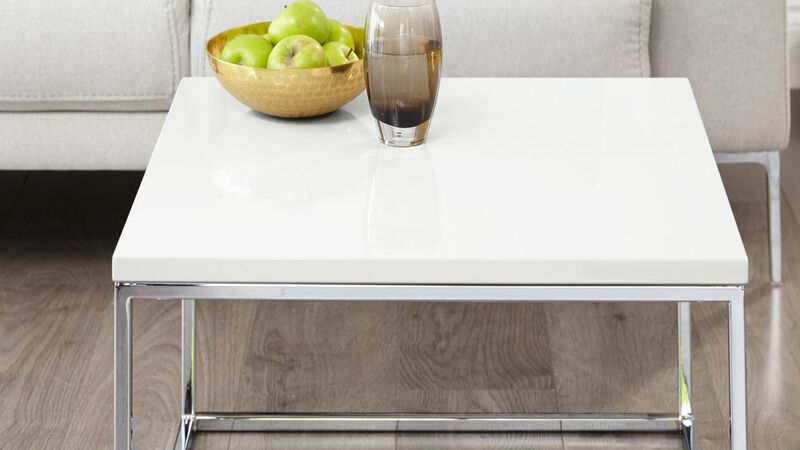 Simple and versatile, the Acute Coffee Table in modern white gloss and chrome is a great coordinate to almost any contemporary living space or family lounge area. Designed with real homes in mind, the shape, size and style will bring such a modern flair and designer look to your home. 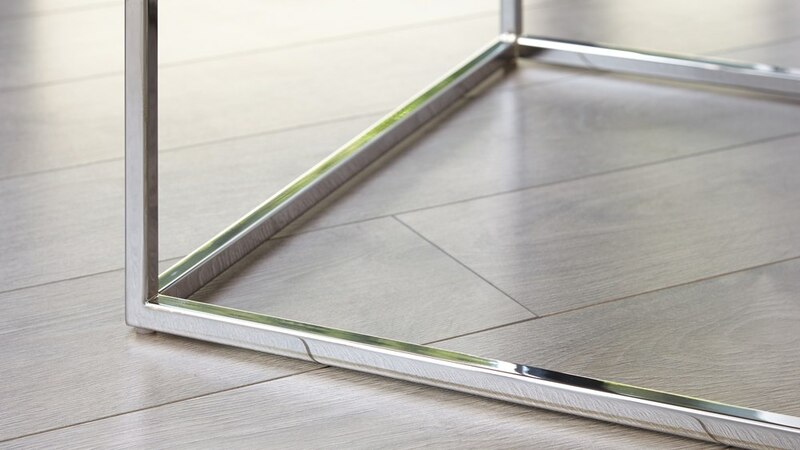 Exclusive to Danetti, our designers have cleverly mixed a white gloss top and shiny chrome frame to create a mixed material piece that can be effortlessly coordinated with a range of interiors. 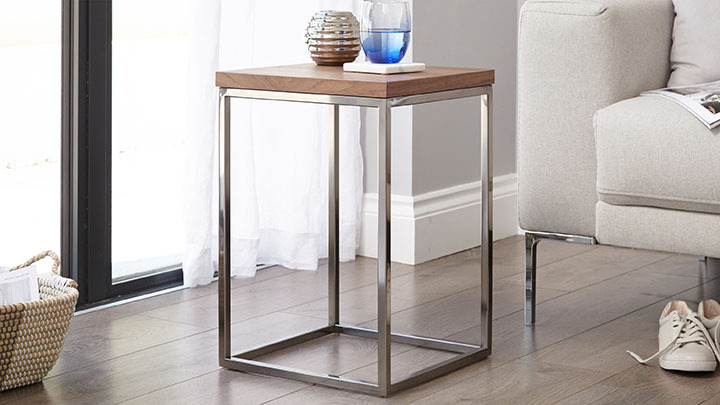 At 60 cm x 60cm, the Acute is ideal for when you need a usable coffee table but you don't have loads of space. It's not so massive that it takes up too much room but provides enough surface space for you to place, style and store your items. The Acute coffee table also works especially well with a corner sofa, allowing enough space to walk around it but not jutting out into the room too much. The coffee table on its own is especially good for smaller spaces, such as by a 2 seater sofa or between 2 armchairs. However, if you have a larger space to fill, you could also style a pair together to create a larger unit that you can separate when needed. The frame of the Acute comes fully assembled. 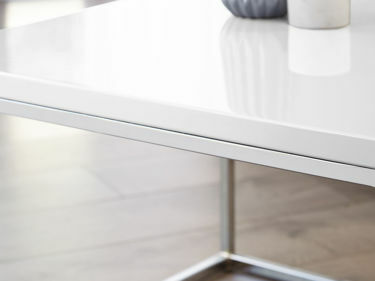 This gives the coffee table such a sleek and seamless look, while also giving the table that straight-out-of-the box wow factor due to its strong, durable and seamless joints. Our premium white gloss has a bright and reflective quality as does the chrome base, both of which will add a touch of luxury to your space. This modern coffee table also comes with floor protectors, so you can place this table on both hard and carpeted flooring. 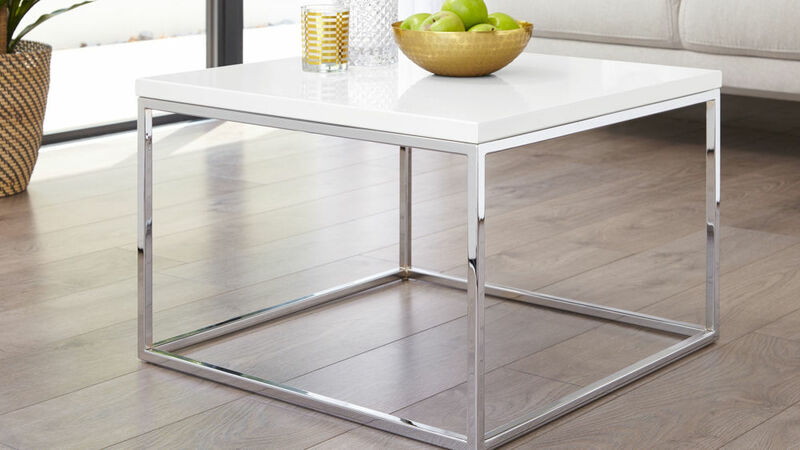 Easy to use, move and style, the Acute White Gloss and Chrome Frame Square Coffee Table ticks all of the right boxes! However, if you'd like a different colour or size, we also have the Acute Grey Gloss and Chrome Frame Square Coffee Table and Acute Large White Gloss and Chrome Coffee Table available.